Last week I was at the grocery store. In the juice aisle. I know, I know — juice isn’t that great for kids, but I started sending juice boxes in my daughter’s lunch as a special treat and now she kind of expects it and at least if she’s drinking juice then she’s not too dehydrated and don’t judge me, okay? I was in the juice aisle. So, of course I looked at the ingredients. And it turned out that none of the organic juice were actually juice. I mean, not entirely juice. They were all a mix of (organic) ingredients of dubious value. And all of them had added sugar. Which left me with the puzzling dilemma: which juice is worse? Real juice with pesticides, or organic not-juice with added sugar? It didn’t take me long to figure out the answer is — you guessed it — neither. 100% juice isn’t really juice. Let’s start with the obvious: juice made from non-organic fruit has pesticides in it. Arsenic, fungicide, and other pesticides are often found in 100% juice, sometimes at levels that the FDA considers unsafe. Personally, I consider any level of poison in my kids’ food unsafe. I’m just sayin’. But that’s obvious, right? — that’s the main reason you want to buy organic in the first place. But unfortunately, the problems with 100% juice don’t stop there. 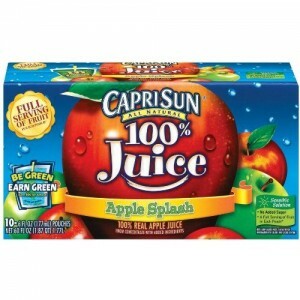 Just because the label says 100% juice doesn’t mean the drink is actually 100% juice. If you were juicing fruit yourself, you would peel the fruit (maybe, depending on what fruit you’re using), take the seeds out, and run everything else through a processor or juicer. You’d probably keep a lot of the fiber, and all the juice would be freshly squeezed straight from the fruit. That is 100% juice. But shelf-stable juice is something else. First, they use big machines that do a much better job of getting out just the juice — which means there’s less fiber and more sugar even in the pure juice. Then, they have to pasteurize it by heating it, which kills any bacteria that would cause it to spoil, but also kills most of the enzymes and vitamins that make the juice healthy. Which leaves? Sugar. Flavor and sugar. That’s in 100% juice. Also, in some cases, the juicing and pasteurization even removes a lot of the flavor, so they use the leftover parts of the fruit to make flavor packets and add that back in. It’s still considered 100% juice, because everything in it was made from the fruit, but the fruit has come a long way from its natural state. Oh, and those vitamins that were lost in pasteurization? Don’t worry. They get added back in too. But the addition of vitamins and nutrients that aren’t naturally in the juice means they’re not balanced by other ingredients that help your body process them. So 100% juice? 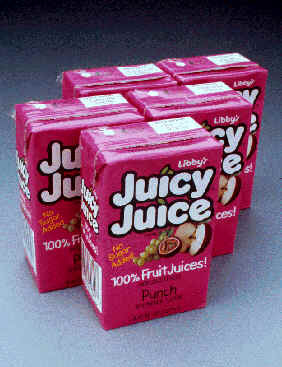 Is hardly juice at all. Organic juice isn’t much better. Take out the bit about the pesticides (assuming, of course, that the label says “100% certified organic,” and not just “organic.” “Organic’ means it has some organic ingredients; “100% certified organic” means it has all organic ingredients. ), and everything else I said about 100% juice holds true for organic juice. Except that instead of starting with the fruit, juice that isn’t “100% juice” starts instead with water and sugar. (Organic cane sugar, but does that really make much of a difference?) Then it adds all sorts of juice concentrates (think dehydrated juice) and flavors. And maybe some vitamins too. Leaving you with a sugary drink that isn’t that much different from fruit-flavored soda. And with any kind of boxed juice, there’s one more insidious little problem I haven’t mentioned yet: the incredible amount of trash generated by a single-serving package. What should my kids drink? So what should I be sending in my kid’s lunchbox? Obviously, the best solution is to buy a nice (preferably steel) water bottle and send water. Since she’ll barely drink water, the next-best solution would be to make my own juice and send that in the nice steel water bottle. Failing that, the third best choice is to buy real juice (organic, unpasteurized, 100% juice) and put that in her water bottle. All of which I am adding to my New Year’s Resolutions. In the meantime, we may as well use up the Juicy Juice. Hope she enjoys it while it lasts. Now excuse me while I eat a real orange.